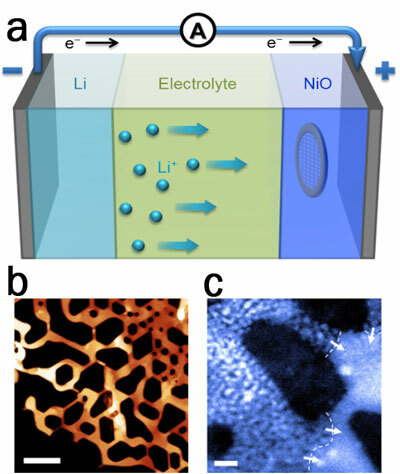 (Nanowerk News) Nanoparticle electrodes in lithium-ion batteries have both near-surface and interior contributions to their redox capacity, each with distinct rate capabilities. Using combined electron microscopy, synchrotron X-ray methods and ab initio calculations, researchers at Brookhaven National Laboratory have investigated the lithiation pathways that occur in NiO electrodes (Nano Letters, "Transitions from Near-Surface to Interior Redox upon Lithiation in Conversion Electrode Materials"). a) Schematic of a rechargeable lithium ion battery cell with a TEM grid, which is used for electron microscopy analysis, submerged inside the electrode. (b-c) scanning transmission electron microscopy images of a NiO electrode when b) pristine (scale bar 100nm) and when c) half-reacted (scale bar 10nm). They find that the near-surface electroactive (Ni2+→Ni0) sites saturated very quickly, and then encounter unexpected difficulty in propagating the phase transition into the electrode (referred to as a “shrinking-core” mode). However, the interior capacity for Ni2+→Ni0 can be accessed efficiently following the nucleation of lithiation fingers, which propagate into the sample bulk, but only after a certain incubation time. The team's microstructural observations of the transition from a slow shrinking-core mode to a faster lithiation finger mode corroborate with synchrotron characterization of large-format batteries, and can be rationalized by stress effects on transport at high-rate discharge. The finite incubation time of the lithiation fingers sets the intrinsic limitation for the rate capability (and thus the power) of NiO for electrochemical energy storage devices. The present work unravels the link between the nanoscale reaction pathways and the C-rate-dependent capacity loss, and provides guidance for the further design of battery materials that favors high C-rate charging. Understanding the link between nanoscale reaction pathways and the resulting electric properties of lithium ion batteries can provide considerable information about how to improve the overall design and longevity of these rechargeable batteries.